I'm all about saving money when I can while modelling. Sure, there are lots of tools you can drop money on, but usually there is a way to do it without the big outlay. 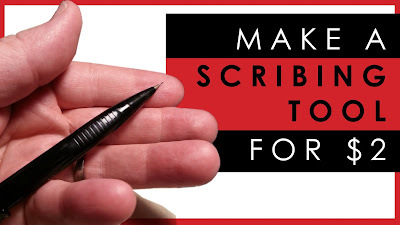 So today I'm showing you how to make your own panel scribing tool - most likely you already have the materials in your home, if not it'll cost you about $2 to build. Bargain. When you build an aircraft model, you usually encounter a problem when mating the two fuselage halves together. You have to sand away the seam between the two halves, and inevitably you lose some of the panel lines. With a decent panel scribing tool, you will have more control and get better results. So check out my video. It's easy, cheap and effective, which is my Holy Grail Trifecta for making models! or alternately here is the video link: How to make your own panel line scribing tool for $2.